by Richard A. Epstein. Cambridge, Massachusetts: Harvard University Press, 2014. 704pp. Cloth $49.95. ISBN: 9780674724891. Reviewed by Charles F. Jacobs, Department of Political Science, St. Norbert College. One of the hottest and most debated books among academics, pundits and the general public alike this year is Thomas Pikkety’s work CAPITAL IN THE TWENTY-FIRST CENTURY (2014), an examination of the impact and role of politics and public policy on economic inequality under capitalist systems. Central to Pikkety’s argument is the notion that governments could, if they wished, do more to undo the growing gap between the rich and the poor. It may seem unusual to preface a review of a work of constitutional theory with reference to a scholarly treatise on economics. However, Richard Epstein’s thoughtful and expansive work is as much about economics as it is about law. Epstein presents his work as a “distinctive synthesis of constitutional law that does not fall squarely within either the conservative or progressive camp” (p.ix), instead utilizing a rigorous application of classical liberal theory to understand and interpret the founding document. As a result, the reader is challenged to contemplate the Constitution not only as a document that framed a government and created a well of fundamental freedoms, but a text that established a system of limited government that secures liberty primarily through the protection of private property. And protection comes not from an active regulatory scheme but instead a government that reduces significantly its impact on markets and the economy through a greater reliance on common law principles and the narrow exercise of government power. Although Epstein likely did not intend it (he began the book in 2006), the work serves as a counterweight to arguments, like that of Pikkety, that promote the positive force of government to ‘fix’ the capitalist system. Epstein instead promotes a constitutional vision that restricts the exercise of power to allow more freedom for property interests, market forces, and private choices. To an extent, the entire book is an exercise in counter-factualism. Epstein’s thesis “is that the older view of the Constitution [classical liberalism] was correct, not only for the conditions of 1787 but also, most emphatically, for vastly more complex conditions today. 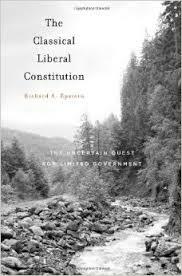 “The book is offered in the spirit of explaining how matters should have evolved and why the original classical liberal constitutional order would have served this nation better” (p.6). The older view according to Epstein reflects the founders’ deep-seated fear of faction and government power that necessitated the creation of structures intended to exercise authority only over those activities absolutely necessary to the governance of the nation. He contrasts this approach to the current and, in his view, theoretically incorrect progressive legal paradigm that has been ascendant since at least the New Deal era. Part I of the book lays out his understanding of classical liberal thought as understood [*338] and applied during the era of American nation building, followed by a review of progressive constitutionalism and the manner in which it strays from the founders’ original design. For Epstein, contemporary difficulties spring from the rise of popular democracy that led to greater regulation (in particular of the economy) that has the effect of creating monopolies by government rather than their control (p.44). Epstein’s touchstone for the modern progressive approach is Associate Justice Stephen Breyer’s work ACTIVE LIBERTY (2005), which offers a pragmatic vision of constitutional interpretation. Epstein argues instead for an interpretive method based on textualism, which follows more closely the approach of Breyer’s colleague Antonin Scalia. Epstein notes that this method is more likely to lead to a “single standard reading of the text” (p.46) and, analogous to the interpretation of contracts, provides avenues by which ambiguities might be resolved more clearly. He goes further than the standard approach to this interpretive method by suggesting an additional layer of analysis that guards against the erosion of nontextual commitments – the principle of anticircumvention, explanations for the exercise of police powers, and remedial choices – that undergird the constitutional system and help to avoid the problems of applying living constitutionalism that is typically driven by current politics and debates. Epstein, a strong advocate for his theory not only in the abstract but also in practice, does not suggest that his theory always could or should displace the more than two centuries of legal decisions that did not follow, in part or whole, his vision of the interpretive enterprise. He recognizes that long-standing precedent does not always need to be replaced merely to apply the original classical liberal vision of the Constitution. He notes, “In some cases, it may well make sense to continue on the path given the accumulated reliance on the earlier precedent” (p.69). In other instances, weak or completely unsupportable interpretive approaches may need to be altered by incremental, complete or radical transformation of doctrine to bring them into alignment with the classical liberal approach. In either case, Epstein seems resigned to the fact that once the interpretive genie was released from the bottle, there is little that can be done to insure a pure application of classical liberal constitutionalism. In Part II of the book, Epstein examines constitutional structures of government in light of his theory. He begins with the judicial power, and analyzes the origins of judicial review, both in common law and American constitutional experience, and the development of the standing and political question doctrines. Although he argues that judicial supremacy was not part of the original design of the founders, he offers general approval for judicial review because of its capacity to blunt the exercise of power. He is more critical of current standing doctrine that limits access to the courts by citizens and the ability to review potential government abuse of authority. In the section that reviews legislative power, Epstein spends considerable time reviewing the theory and application of the commerce clause, including the dormant commerce power and taxing and spending authority, articulated in Article I of the Constitution. In both [*339] cases he decries the massive expansion of government power that permitted both the federal and state governments to regulate nearly every aspect of the economy (p.145). Epstein also takes the opportunity to evaluate the executive authority with an emphasis on the expansion of the bureaucracy and use of delegated authority. Part III of the work applies the classical liberal approach to the area of individual rights. He eschews any discussion of the rights of the criminally accused to focus on freedom of speech and religion as well as an examination of equal protection. While these areas attract considerable analysis, Epstein begins with rights related to property including a review of the takings power and the freedom to contract. Regarding the latter, he voices support for the LOCHNER era doctrine that significantly limited the ability of legislatures to interfere with contractual relationships. The affirmation for a long-repudiated dogma demonstrates Epstein’s thorough support for limited government and expansive liberty. The only significant regulatory controls he contemplates for government in this arena concern protection against fraud and what he describes as “adverse effects on third parties” (p.338). He adds that any regulation beyond these narrow exceptions deserve, like fundamental freedoms, the application of strict scrutiny by courts. He holds only contempt for the creation and application by the United States Supreme Court of the rational basis test, which he claims offers too much deference to the exercise of government power. As noted, Epstein’s discussion of liberty related to property precedes the discussion of other enumerated rights. He contends that “the most reliable protections for speech and religion come from the security of a sound basic system of law unrelated to particular issues of either speech or religion. It is virtually impossible to envision how the state could interfere with, let alone terrorize, religious and political institutions if in all cases it systematically and unflinchingly protected property rights and economic liberties” (p.383). As a result of this position, his analysis of speech, religion, and equal protection typically begins from principles of markets and contractual relationships. Hence, the discussion of regulations such as Sunday Blue Laws focuses less on religious practice and more on the effects of the public policy. For Epstein, the Court’s analysis is wrong-headed because in creates “an indefensibly broad definition of a negative externality that levers an enormous wealth transfer to Christians who keep the Sunday Sabbath from everyone else” (p.494). In his conclusion, Epstein reiterates that the “profound progressive break with the classical liberal tradition” has led to what he describes as “the major disarray that infects every area of modern American life” (p.569). The litany of problems includes “steady decline in the average standard of living; constant battles over debt limits and fiscal cliffs; uncertainty over key elements of the tax structure; massive regulation…” among others (p. 569). The adoption of a progressive interpretive approach, and its kissing-cousin conservatism, has in Epstein’s judgment created legal models “that are too divorced from the constitutional text, constitutional theory, and private law” that have created “long-term adverse effects on the power of a [*340] nation to regenerate and recreate itself” (p.581). The clearer admission he makes in the final pages of the concluding chapter is the classical liberal approach is not merely a theory of the Constitution but also an argument for an economic interpretation of the document that looks and sounds much like laissez-faire. He notes the pejorative nature of that term and is careful to provide an “astute version” of the concept. To his mind, constitutional and economic laissez-faire simply means an earnest attempt to limit the power of government in deference to the positive forces of individual liberty. This book is an interesting and challenging read in large part because Epstein does not simply rework the common theoretical tropes that you encounter today. This is not a new gloss on an old idea, such as a re-worked understanding originalism. He provides a new foundation from which to launch an attack on contemporary forms of interpretation. And if the reader might suspect that his analysis will align with members of the current high court and their theoretical predispositions, one may be surprised to discover that Epstein levies significant criticism against virtually every justice sitting today as well dozens of notable jurists from the past. These attacks are tethered to careful analyses of hundreds of cases across American legal history that are buttressed by reference to scholars of law and history. The nearly 600 hundred pages of text are peppered with more than 1,700 citations causing considerable wear to the book’s binding flipping between the argument and Epstein’s support for his position. This depth helps to illuminate well the theory he expounds and demonstrate the faults he claims developed over time regarding the interpretation of the Constitution. While not always dispositive, the new theoretical approach on doctrine and individual cases provides a new lens with which to view the development of law and its impact on public policy. Despite the general thoroughness and length of this work, there are three areas in which Epstein could have expanded his discussion. The first is his description of the classical liberal synthesis and its origins in European liberalism. There is a great complexity among the theorists who gave birth to this movement. Additionally there exists a vast literature that seeks to understand how the various strands of liberalism influence the creation of the American state. Greater attention to this diverse, and often conflicting, scholarship may have provided greater support for his position. In this same vein, Epstein only touched on the issue of consent and popular democracy. In most instances, he denounces the unflagging support of public deliberation and participation in policy making by progressive legal practitioners. It would have been helpful to know when and how consent and democratic choice is appropriate under his vision of classical liberalism. Finally, he gives similarly short shrift to the varied approaches to what he labels progressivism and proponents of a living constitution. As noted earlier, the standard-bearer for the author is Justice Breyer, who is criticized for not adequately explaining the progressive position. Breyer himself indicates that he is not providing a complete theoretical defense in his slim volume. But even if he had, Epstein himself does not sufficiently mine the thinkers who originally promoted the progressive vision in the decades surrounding the [*341] New Deal era nor does he engage contemporary authors such as Bruce Ackerman or Jack Balkin who do offer broader and more full-throated defenses of progressivism. None of these issues, however, significantly weaken an otherwise significant piece of scholarship that should be read by anyone serious about understanding the methods of constitutional interpretation available to scholars and jurists alike. Breyer, Stephen. 2005. ACTIVE LIBERTY: INTERPRETING OUT DEMOCRATIC CONSTITUTION. New York: Vintage Books. Pikkety, Thomas. 2014. CAPITAL IN THE TWENTY-FIRST CENTURY. Cambridge, Massachusetts: Belknap Press. LOCHNER V. NEW YORK 198 U.S. 45 (1908).